These smoky tofu dumplings are pan-fried to a delicious crisp and served with spicy sweet chili dipping sauce that whips up in minutes. It looks like this week’s theme is dishes inspired by accidents where people accidentally ate meat. This wasn’t intentional. Just kind of happened. Anyhow, on Monday it was my husband’s sad story, and today it’s mine. I think I mentioned this one before, but one of the last times I had this type of accident was at a Thai restaurant where I wolfed down what I thought was a veggie dumpling, only to discover that it was in fact a pork dumpling. So sad. 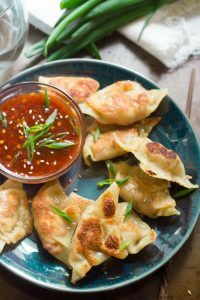 So when I got it in my head that it was time to cook up some dumplings for this site and I started brainstorming for dumpling fillings, something mimicking pork dumplings was the first thing that came to mind. 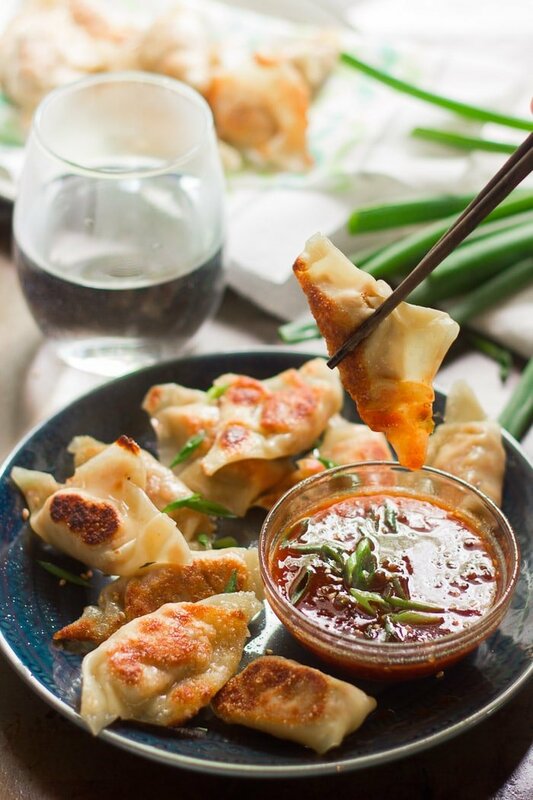 I decided it was a good way to transform the Thai restaurant incident into something positive, so I went all out and made some crispy Thai-inspired smoky tofu dumplings with sweet chili sauce. The chili sauce, in case you were wondering, is a total cheat. Every recipe I’ve ever seen for sweet chili sauce involves whole peppers, but dumplings are enough of a project on their own, so I settled for a mix of sambal oelek, maple syrup and rice vinegar. It totally worked! Tastes just like all the other sweet chili dipping sauces I’ve ever had. These dumplings totally made me feel better about accidentally eating pork. And guess what? I even went and did something super cool with them, and by super cool I mean something other than just dipping and eating them. Like, I included them in a whole other recipe. Dumpling double whammy. Stay tuned for that! P.S. If you’d prefer less oil, check out my steamed tofu potstickers. And if you’re not into tofu, try my edamame wontons. To make the dumplings, coat the bottom of a large skillet with 1 1/2 teaspoons of oil and place over medium heat. When the oil is hot, add the garlic, ginger, and scallion to the skillet. Sauté for about 1 minute, until very fragrant. Crumble in the tofu and continue to cook for about 5 minutes, until it dries up just a bit, flipping occasionally with a spatula. 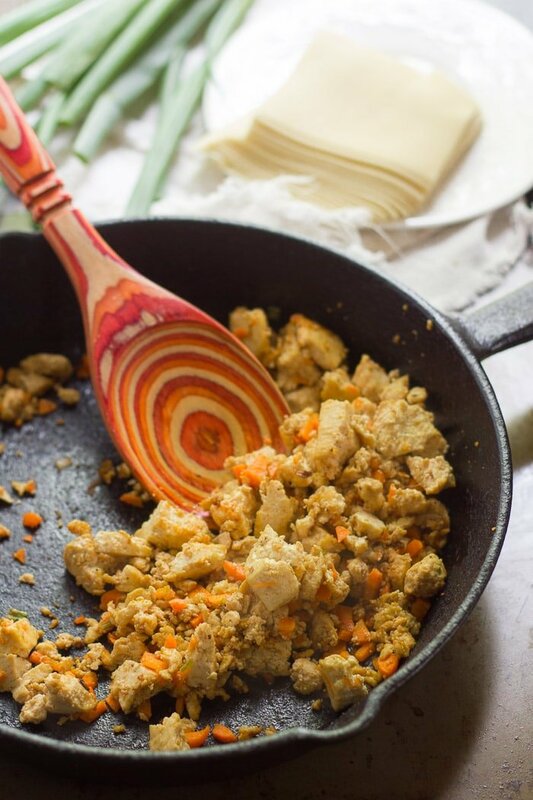 Add the soy sauce, liquid smoke, and carrot to the skillet and flip a few times to incorporate. Continue cooking about 2 minutes more, just to soften up the carrot a bit. Fill a small bowl with water. Set a wonton wrapper on a work surface and spoon a heaping teaspoon of the tofu mixture into the center of the wrapper. Moisten the edges of the wrapper with water, fold it over the filling, and press to seal. Repeat until all of the wrappers and filling are used. Wipe out the skillet that you used for the tofu, then generously coat the bottom with oil and place it over medium heat. Add a few dumplings, being careful not to crowd the skillet, and cook for about 3 minutes on each side, until crispy. Transfer the cooked dumplings to a paper towel-lined plate. Repeat until all of the dumplings are cooked, adding oil to the skillet as needed between batches. Make the sweet chili dipping sauce by stirring all ingredients together in a small bowl. I like to garnish mine with the green parts of the scallions and a few sesame seeds. 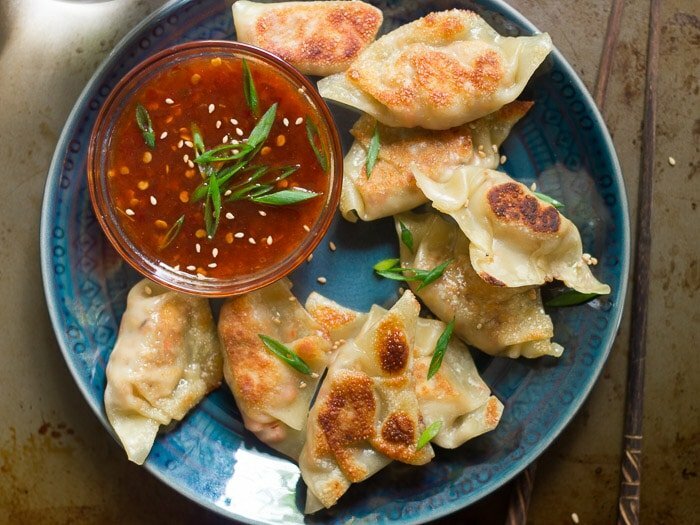 Serve the dumplings with the sweet chili dipping sauce. *Check the ingredients to ensure that your wonton wrappers are vegan. I usually buy them at Wegmans or an Asian market. You can also make your own without too much effort. This looks really, really good and I love anything that has me using wonton wrappers. I’ll have to try Trader Joe’s. I don’t think I’ve ever gotten anything there I didn’t like! These look tasty and not deep fried! This recipe gave me huge cravings! So I got dressed and went to the Asia store and bought Wantan shells, came home and made them. I was surprised how much the filling tastes like pork once it is fried in the shells. Definitely one of the best things I’ve tried in a while. Thank you for the recipe! Absolutely delicious. I’m so glad you liked them!! Thanks so much! 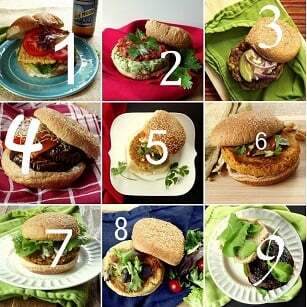 I love the connoisseur vegan recipes I have made 2 so far. And love everything I have made. Is there a cookbook with the recipes in ? Best new recipe I’ve tried in a while! So easy to make and ready in no time. I’ve made them three times this week (once with mini apple pies fried in the wonton wraps. Thank you! Planning to try the pot-stickers next. Had not heard of Sombel pellets and when Inlooked up it has fish and shrimp in it, is there a vegan version like can i use gochu chang in place? Sorry auto correct respelled words! Right now! Very good though! Next time less spice lol! These are great! I doubled the recipe, laid them out on trays, and froze them. Then I transferred them to a large freezer container. They went straight from the freezer to the frying pan with no problem. So much better and healthier than store bought. You have the best recipes! Thank you so much!! I’m so glad you enjoyed them! These look amazing. Do you think they would work in an air fryer? I don’t have an air fryer, but from what I know about them I think it would work. I’d love to hear about it if you try!